The Fitwel tool also identified some manageable improvements, such as signage at decision points (to use stairs or to wash hands, for example) to bump the project up to the 105 points required for two stars. Going further, some operations decisions could bring the 125 points needed for three-star certification into range. Shawmut plans to pursue certification in the next fiscal year. With existing buildings eligible for Fitwel, designing for health can also include a client’s whole portfolio. The tool’s benchmarking function allows owners to compare holdings and to evaluate possibilities for leasing or renovation. 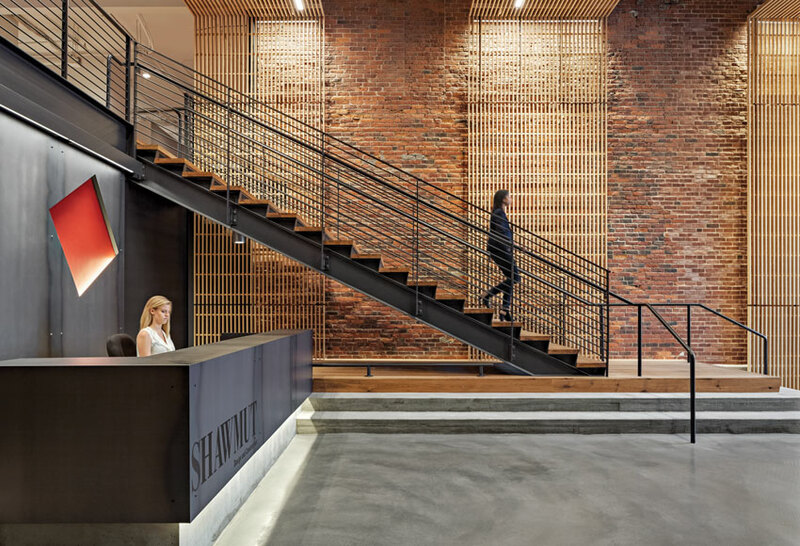 Prominent and inviting circulation is among many features that should help Shawmut Design + Construction’s Boston headquarters, designed by CBT, achieve Fitwel certification. Alexandria Real Estate Equities, a developer focused on science and technology campuses, has so far achieved five Fitwel three-star ratings. “In a demanding marketplace, these certifications validate what we’re already doing to create healthy conditions for our tenants,” says Vincent Ciruzzi, Alexandria’s chief development officer. Although Fitwel can also serve as a road map for construction, Alexandria intends to pursue LEED and WELL for its new buildings. In keeping with the intention to make it accessible, Fitwel is the less expensive option. CfAD charges an annual $500 registration fee and $6,000 for certification, including a double-­blind independent third-party assessment and any subsequent appeals. In contrast, IWBI registration fees vary with project type and size, and range from $1,500 to $10,000. For WELL certification, which is managed by Green Business Certification Inc. (the same entity that manages LEED certifications), costs start at $4,000. The process involves an on-site audit and measurements of water, air, and light quality, and acoustics, which entail an addition­al fee, as does recertification (required every three years). But as part of IWBI’s status as a public benefit corporation—a for-profit entity whose mission includes a positive impact on society—it will donate 51 percent of net profits from these fees toward philan­thropy, once IWBI is profitable, which Fedrizzi estimates is about two and a half or three years away. Advocates of the wellness standards argue that the added expense, even of the more costly of the two systems, is worth it. The construction manager Structure Tone moved into its Gensler-designed New York offices near Penn Station last summer. Robert Leon, vice president of global services, estimates that all hard and soft costs connected with the project’s registration and certification added about $1 per square foot to the 82,000-square-foot interior renovation project. Going forward, he expects maintaining its WELL Silver status, including recertification and operational and organizational costs such as those associated with healthy food in the cafeteria or bike-share memberships, to amount to about $100 per employee each year. Davis Partnership is pursuing both LEED and WELL for the Colorado Health Foundation, in Denver. The firm had to satisfy daylighting and glare-control requirements while limiting glazing. Leon contends that the certification will easily pay for itself with increased productivity and better retention rates. Several sources point to an often-cited report by the consulting firm the Muldavin Company. It pegs the average corporate investment in wellness programs at $700 per employee per year, but puts employee participation at below 50 percent. “Much of this money is wasted,” says James Stawniczy, senior consultant for wellness at HOK. But the strategies in WELL provide a passive benefit to all occupants, according to the study, which estimates that superior indoor environmental quality can improve work performance by as much as 10 percent.